"cider before beer, never fear; beer before cider, makes a bad rider"
2 towns ciderhouse 350mL 500mL 650mL 750mL alpenfire angry orchard barrel-aged Central City Brewing cider house collection cider reviews corporate sellouts crispin cider Fernie Brewing Co. finnriver cider fruit beer throwdown hopped ciders Howe Sound Brewing Co. Kamloops Kelowna Lighthouse Brewing Co. limited release Parallel 49 pear ciders Penticton Phillips Brewing Prohibition Brewing pumpkin cider PUMPKINDROME Quesnel Red Collar Brewing schilling cider sea cider seasonal seattle cider six pack square mile cider Steamworks Brewery tieton cider works Tin Whistle Brewing Co. Vancouver Victoria weird beer honour roll Whistler Whistler Brewing Co.
I’m going into this “Bourbon Barrel” limited release from Left Field somewhat blind, as it’s not described on their website or the bottle (beyond some info about the Cidermaker’s Select series in general). I gathered from Left Field’s Facebook that it’s fermented in bourbon barrels, but have no idea about age or anything else really. Much like the Pear Dry, it pours a very pale, clear yellow. I feel pretty safe in saying that if you like one thing they’ve made, you’re likely to enjoy the rest of their catalog. The aroma is mainly apples, mainly tart — I’m guessing cider apples, not so many dessert apples — with some drier, almost papery notes and a touch of funk likely coming in from the bourbon barrels. 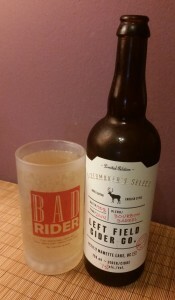 Left Field is more the latter than the former — it tastes different than a non-barrel-aged cider, but not in a drastic way. It’s pretty dry, crisp, and acidic, and the aftertaste gets a slight bit woody. In hindsight I should have held on to the other Left Field ciders I had to do a comparison tasting. Some cideries’ offerings tend to have a certain familial resemblance, while others vary wildly; Left Field seems to be one of the former. From what I can recall, I would say this comes out closest to their English Dry variety. All in all it’s not bad but I prefer their Pear Dry, or the Big/Little Dry. The bourbon-barrel fermentation just doesn’t add that much (unless, I guess, you’re into very subtle taste variations). Still, again — if you like one of their ciders you’ll probably like others. Posted in Cider. Tagged barrel-aged, bourbon barrel, cidermaker's select, left field cider co, limited release. "Cockrell Hard Cider's "Devil 'N Cider" -- a cider in all caps https://t.co/aREoTcK3Me"
"A truly restrained number of @HamiltonMusical references in today's review of Aaron Burr Cidery's "Hemlock Apple" https://t.co/aHFHglI0gV"
"American Apple from @JesterandJudge: the Goldilocks of hard ciders https://t.co/JjAlgtjPwM"
"Saturday night hot takes from Bad Rider Reviews: https://t.co/g3PaYyYAhs"